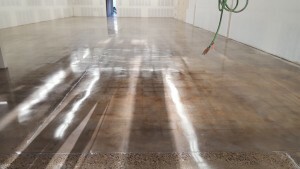 Polished concrete is a combination of mechanical grinding, honing, & polishing, combined with chemical densifying to produce a fully refined surface that is dust proof, light reflective, stain resistant, durable, and easy to maintain. With the combination of staining, decorative saw cutting, logo stenciling, aggregate exposure, and polishable overlays; the beauty and design possibilities are limited only by the imagination. Light reflectivity is a major environmental benefit of polished concrete. Interior surfaces with high reflectivity can reduce the lighting requirements for the structure. Indoor air quality is benefit of polished concrete and especially important for schools, public buildings, and hospitals. Polished concrete is resistant to mold and fungus growth, does not trap dust or allergens, does not out-gas harmful or toxic substances, and acts as an air barrier limiting moisture mitigation. 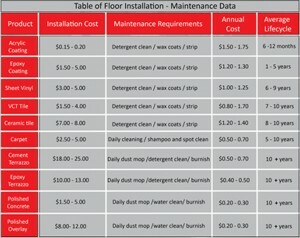 Polished concrete’s environmental benefits will contribute to several LEED point categories.